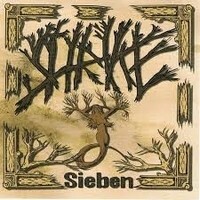 Third album from SHRIKE, German band from Berlin playing Black Metal spiced with some Death. The album name is “Sieben”, seven in English indicating the period the band is formed, seven years ago. The album starts with “Kreise” that starts with a full blown attack of drums, massive riffing, and mind blowing vocals. The sound of SHRIKE is very special, it reminded me of black metal infused with classic Death Metal from mid-80’s. All songs follow the steps of “Kreise”, even though track number three “Shrike” (like the band name) has some kind of Crust Metal flavor to it that elevates the track to new heights. Listen to the track and you will find a surprise with a low tempo middle section that redefines black metal, at least for SHRIKE I think that this track should get into black metal pantheon. Track four “Die Farben der Sehnsucht” uses a more IMMORTAL style riffing and divert out from the Black Death Metal that the first three songs had. The best thing about SHRIKE is their “dirty” sound, black as black should be, what I call pitch black, black always sounds blacker when it’s in German.